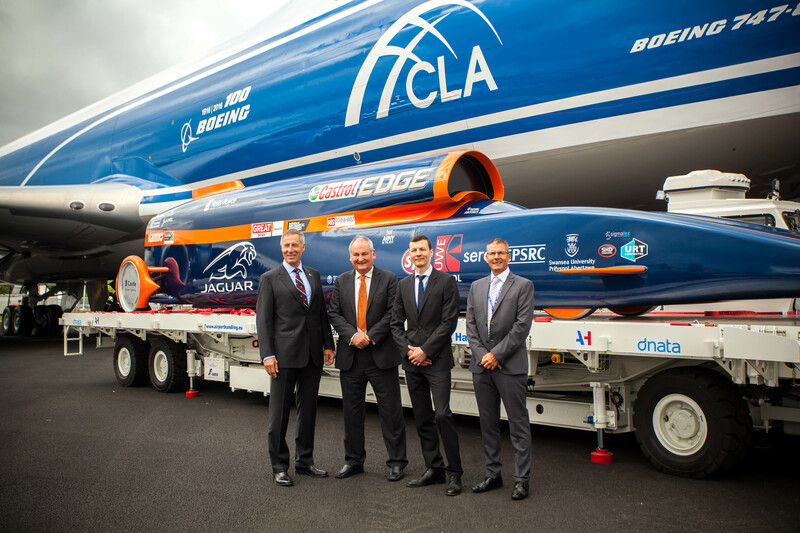 CargoLogicAir, the new British cargo airline, has today signed a Memorandum of Understanding (MoU) to be the exclusive air cargo partner for The BLOODHOUND Project’s attempt to set a new World Land Speed Record in South Africa in 2017, and to break through the 1,000mph barrier in 2018. The agreement will see CargoLogicAir fly BLOODHOUND SSC from its UK base to and from South Africa, where its world record attempts will take place on the Hakskeenpan dried lake bed in the Northern Cape. The flights to Upington Airport will also carry support equipment, and the airline will provide a resupply and returns service for the transportation of car parts and equipment. The BLOODHEAD team, led by Project Director, Richard Noble OBE, and driver, Andy Green OBE, hopes to set a new world land speed record of 800mph next year before returning to South Africa in 2018 to try for the 1,000mph target. Andy Green holds the current record of 763.035mph, which he set in 1997 in the Black Rock Desert in Nevada, driving the Thrust Supersonic Car. Richard Noble, also Project Director of ThrustSSC, set the world record himself at 633.468mph, which he held from 1983 to 1997. Both men attended the Farnborough International Airshow today to tour CargoLogicAir’s new Boeing 747-8 Freighter and provide an update on the progress of the project. CargoLogicAir’s participation in the world land speed record attempt follows that of its partner, Volga-Dnepr Group in 1997. Then, with the weather window for the attempt quickly disappearing and the prospect of it taking several weeks to move ThrustSSC and all of its support equipment to the U.S. by sea and land, Volga-Dnepr stepped in and helped the team transport everything from the UK to the U.S. within 24 hours onboard its Antonov 124-100. This air logistics solution was recognised as a major contributing factor in helping ThrustSSC break through the sound barrier on its way to the record. Based at London Stansted Airport, CargoLogicAir received its UK Air Operator Certificate at the start of 2016. At Farnborough International Airshow2016, it has taken delivery of its first Boeing 747-8F, which joins its existing 747-400F. The airline expects to grow its fleet to five aircraft within its first five years of operations.